We've seen heroes introduced in many different ways since the Marvel Cinematic Universe started to take over the multiplex universe in the past several years. They've been gods fallen to Earth, and scrawny men turned into something like gods. They've been badasses and screw-ups and tormented scientists, but they've all more or less felt the way super-heroes are supposed to feel. And then there's the way co-writer/director James Gunn introduces Peter Quill (Chris Pratt)—aka Star-Lord—in Guardians of the Galaxy: as a thief on an alien planet, wearing an old-school Walkman and headphones, dancing along to Redbone's 1974 song "Come and Get Your Love" while turning a lizard-like specimen of the local fauna into an impromptu Mr. Microphone. Even if you're the biggest geeky fan of Marvel's attempt to create an integrated series of movies, it's hard to deny that all that planning and strategizing has resulted in a certain sameness of fan-pleasing structure and tone. But there's something uniquely weird about Guardians of the Galaxy for most of its running time. Where other comic-book fare has felt like action blockbusters with sprinkles of comic relief, Gunn has been allowed to make a comedy that happens to feature comic-book characters. The titular quintet is nothing like a team as the story opens; indeed, they mostly seem interested in killing one another in various permutations. Quill, an Earth man kidnapped by intergalactic pirates as a child and raised in their ways, has alienated his gang while trying to obtain a mysterious orb. A pair of mercenary partners—the genetically modified raccoon creature Rocket (voiced by Bradley Cooper) and the sentient tree-thing Groot (voiced by Vin Diesel)—have been hired to retrieve Quill for the disgruntled pirates. The assassin Gamora (Zoe Saldana)—working for the villainous Ronan (Lee Pace)—is out to get the same orb that Quill has recovered. And the hulking Drax (pro wrestler Dave Bautista) wants to murder Gamora, or at least use her to get to Ronan, who was responsible for the death of Drax's wife and child. The dysfunctional family dynamic has played a role in other comic-book teams—including Joss Whedon's mega-successful take on The Avengers—but there's a different vibe to Gunn's approach here. These five characters are all isolated in some fashion—whether by loss of their family, or never actually having one—and, in their way, kind of desperate for genuine connection. Even when the movie is getting silly, Guardians manages to lock in on that sense of how their emotional need for one another overrides their instinct for distrust. It gets quite silly, indeed, but that turns out to be its secret weapon. For anyone who saw Gunn's 2010 feature Super—with Rainn Wilson as a costumed vigilante wreaking disproportionate vengeance on criminals—it's no surprise that he has a particularly demented take on comic-book tropes. What's surprising is that Marvel allows him to cut loose with his B-movie sense of what-the-hell abandon, even as he's cranking out energetic set pieces, like a chase that finds Rocket, Groot and Gamora all pursuing Quill through an alien-world metropolis. He gets to throw in oddball touches, like Quill regaling Gamora with a tale from his planet about the importance of dancing, "The Legend of Footloose." The characters are prickly and charming, led by Pratt's wonderfully charismatic take on anti-heroic heroism, and a surprisingly funny Bautista as the literal-minded Drax. And there's a laughter-blows-the-roof-off-the-theater moment in the mold of Hulk's rag-doll maneuver on Loki in The Avengers, this one courtesy of Groot. Guardians is so wonderfully idiosyncratic for so long that it's kind of a bummer to watch it wrap up with an obligatory feeling world-in-peril finale, as Ronan's massive warship attacks the capital of the empire with which he has a racial-separatist beef. The sprawling dogfight hits all the "look at this, ain't it spectacular" buttons, yet that's exactly when it feels as though Gunn was obliged to take script notes from the Marvel formula, lest fans somehow wind up disappointed that it's more hilarious than awesome. 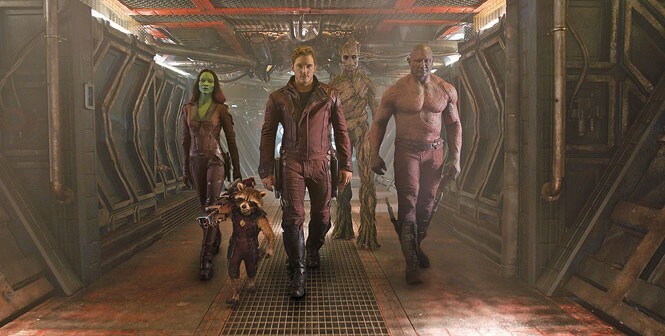 Guardians of the Galaxy is, however, most delightful exactly when it's its own goofy, punky self. Sure, Gunn's gonna give you the sequence where the team finally pulls together and does its slow-motion "hero walk." But he's gonna work from Quill's beloved Walkman mix tape and have them do that walk to the Runaways' "Cherry Bomb." We could use more heroes like that. Guardians of the Galaxy is not showing in any area theaters on Saturday, April 20. The next date is playing is Wednesday, April 24 .